What is an Occupant Evacuation Elevator? Much like Fire Service Access Elevators, Occupant Evacuation Elevators are in fact elevators that have strict rules and regulations put in place to allow special uses above standard elevators. An Occupant Evacuation Elevator can be used for self-evacuation during a fire emergency pending the elevator system meets the requirements set forth in the International Building Code. What Code Requires or Allows the Use of Occupant Evacuation Elevators? The requirement to provide occupant evacuation elevators can be found in the IBC or International Building Code 2015 section 403.5.2 within the EXCEPTION. "For buildings other than Group R-2 that are more than 420 feet in building height, one additional interior stairway meeting the requirements of Sections 1011 and 1023 shall be provided in addition to the minimum number of exits required by Section 1006.3. The total width of any combination of remaining interior exit stairways with one interior exist stairway removed shall be not less than the total width required by Section 1005.1. Scissor stairways shall not be considered the additional interior exit stairway required by this section." Exception: An additional interior exit stairway shall NOT be required to be installed in buildings having elevators used for occupant self-evacuation in accordance with Section 3008." Furthermore, the International Building Code 2015 Section 403.6.2 Occupant Evacuation Elevators. States, "Where installed in accordance with Section 3008, passenger elevators for public use shall be permitted to be used for occupant self-evacuation." The requirements on how an occupant evacuation elevator is to be installed can be found in the IBC or International Building Code 2015 section 3008. When an occupant evacuation elevator is to be used for occupant self-evacuation during a fire, all passenger elevators for public use shall comply with Sections 3008.1 through 3008.10. If any additional elevators are are used for self-evacuation, those elevators shall comply with these sections as well. In buildings that utilize occupant evacuation elevators, a fire safety and evacuation plan shall be approved and in place. Requirements for a fire safety and evacuation plan can be found in the International Fire Code (IFC) 2015 section 404 "Emergency Planning and Preparedness". The operation of self-evacuating occupant evacuation elevators shall comply with the requirements in ASME A17.1, CSA B44 and the above mentioned Fire Safety and Evacuation Plan. The building shall be equipped with an emergency voice/alarm communication system that is accessible to the fire department. System shall be installed in accordance to section 907.5.2.2. 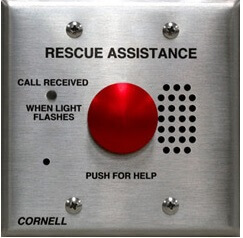 Each elevator lobby used for occupant evacuation shall be equipped with at least one audible and one visual notification appliance. Not that it would be common but if you had to install voice evacuation just for the occupant evacuation elevators, it is allowed to mix audible evacuation tones. Find out more in this article, "Mixing Speakers and Horns for Fire Alarm." The lobby on each floor served by the fire service access elevator shall have an approved method of preventing water from the operation of the automatic sprinkler system from infiltrating the FSAE hoistway. Lastly, a means for elevator shutdown or Shunt Trip in accordance with IBC section 3005.5 shall NOT be installed on elevator controllers used for occupant evacuation elevators. The shaft or hoistway enclosure shall comply with IBC section 713 "Shaft Enclosures" as well as section 403.2.3.4 "Wall Assembly" and sections 403.2.3.4 "Other Wall Assemblies". Although this is not a direct requirement for occupant evacuation elevators or fire service access elevators rather buildings that are four stories or more, it still applies and is worth mentioning. IBC section 3002.4 "Elevator Car to Accommodate Ambulance Stretcher" gives us the dimensions required for the cab. "The elevator car shall be of such a size and arrangement to accommodate an ambulance stretcher 24 inches by 84 inches with not less than 5 inch radius corners, in the horizontal, open position. ADA Table 407.4.1 breaks this down a little further and gives us the following: The cab shall be provided with a minimum clear distance between walls and door excluding return panels not less than 80 inches by 54 inches and a minimum distance from wall to return panel not less than 51 inches with a 42 inch side slide door. The occupant evacuation elevator lobby shall accommodate 3 square feet per person, not less than 25 percent of the occupant load of the floor area served by the lobby. Occupant evacuation elevator lobbies shall be able to house one wheelchair with a space of 30 inches by 48 inches for every 50 persons within the area the lobby serves. There is an exception to these 2 rules. The size of an elevator lobby that serves multiple banks of elevators shall have the minimum area APPROVED on an individual basis. This sizing shall be consistent with the building's fire safety and evacuation plan. The occupant evacuation elevator lobby doors shall be provided with a 3/4 hour fire door assembly complying with Section 716.5. Doors shall comply with the smoke and draft control assembly requirements of Section 716.5.3.1 and UL 1784 test conducted WITHOUT the artificial bottom seal. There shall also be a fire protection rated glazed vision window within the occupant evacuation elevator lobby doors. No different from standard elevators or fire service access elevators, the lobby doors of occupant evacuation elevator lobbies shall close upon receipt of the fire alarm system serving the building. The self closing mechanism shall close the door from a fully open position (90 degrees) to 12 degrees from the latch at a minimum of 5 seconds. This insures the doors do not close to quickly. This information can be located in ANSI 117.1 2009 section 404.2.7.1. How are Occupant Evacuation Elevators Designated or Noticed? On all floor served by the occupant evacuation elevator, there shall be an approved sign posted adjacent to each call station. We suggest consulting with your local AHJ if they have a standard on this signage. Status of normal power conditions to the elevator equipment, machinery, electrical apparatus cooling equipment, elevator machine room, control room and control space ventilation and cooling equipment. Status of standby or emergency power conditions to the elevator equipment, machinery, electrical apparatus cooling equipment, elevator machine room, control room and control space ventilation and cooling equipment. Ventilation for elevator machine rooms, elevator control rooms, machine and control spaces. He is the big one to watch out for. Wires and cables located OUTSIDE of the fire service access elevator lobby and machine room that are provided for the fire-detection system shall be protected by construction having a fire-resistance rating of not less than 2 hours, shall be circuit integrity (CI) cable with a rating of not less than 2 hours or shall be protected by a listed electrical protective system having a rating of not less than 2 hours. All code references for this article are found in the 2015 Edition of the International Building Code.